This comfortable place is on the bus route, with the stop just at the bottom of the street at the beautiful, Twin Lakes park, which is a great place to recreate. It's a 10 minute walk to the hospital and all of the medical facilities, and it's three miles to downtown Juneau, 5.5 miles to the airport, and 12 miles to the Mendenhall Glacier. If you're in Juneau to stock up on goods, Costco is just 2.5 miles away. Host, Kelli, happens to be a co-owner of a large tour company with over 25 tours throughout Alaska, and offers 15% discount on all tours offered by the company to her vacation rental guests. Popular tours offered include whale watching, salmon bakes, river rafting, kayaking, canoe tours, boat tours, hiking, gold panning, private cars, Mendenhall Glacier tours, jeep tours, Alaska RV and Cruise tour packages, and more. There are two miles of paved, pretty flat, trails along Twin Lakes. You can easily walk to the Hatchery, which is a super cool, not very expensive attraction for visitors, and you can fish there for free if you have the equipment. Blackerbee trailhead is just steps away for the advanced hiker and Salmon Creek trailhead is a 15 minute walk for the intermediate level hiker. If you stay here in the summer, you can also walk to the famous Gold Creek Salmon Bake in 10 minutes. The salmon bake is an all you can eat, upscale Alaska picnic situated in a rainforest setting along salmon creek, with a short stroll to beautiful Salmon Creek Falls and the entrance to the Old Wagner Mine. You can roast marshmallows over a camp fire or have a beer or a glass of wine on the deck overlooking the creek. They have live music and a delicious meal featuring wild Alaska salmon grilled over an open alder wood flame. Life-long Alaskan, I love Juneau! I've been helping people have great Alaska vacations for over 20 years with my involvement in state tourism marketing, hotel management, and owner/operator of my own tour companies. I love the garden, the serenity as it backs to BLM land and is high on the hill in a quiet neighborhood, but mostly I love the channel view. I also enjoy the easy access to anything in Juneau with it's central location. Access to beginner, intermediate, and advanced trails within close walking distance is a plus. The fire pit at the top of the garden is also a fun amenity. Host offers 15% discount on any tour offered by Alaska Travel Adventures, Inc.
Firepit at the top of meandering rock garden. The apartment was wonderful and well stocked with pots, pans, dishes, towels, everything needed for a home away from home, and the nice hot shower was excellent after a long day out in subfreezing temperatures. The views are incredible across to Douglas Island and of the water that comes in and goes out with the tides. Kelli was available when needed and was very accomodating. I do have to say that the people that live upstairs are very loud. You can hear the vacuum, the tv, conversations, and the 2 large dogs run across the floor directly above the bed causing vibrations that make the ceiling fan rock back and forth with the booms. The dogs are left in the garage occasionally or on the front porch and bark a lot. The wall at the head of the bed is shared with the garage so when the dogs started barking it startled me out of sleep early in the morning, and they barked for a solid hour. I was inside most of the day working so heard most everything going on upstairs. If you will be gone most of the day, then the neighbors upstairs shouldn't be much of a bother. I do recommend it overall. It's a very nice place! I'm glad to get this feedback, so that I can work with the family upstairs to be mindful of downstairs guests. I also want to make sure readers understand that this guest was in the apartment all day working from there. It sounds like the dogs were put in the garage in the morning, and that it takes them an hour to settle down once being put in there. I'll find out. The good news is that the kids are pretty little and bed time for them is at 8:00pm, so it's family noise during reasonable times. However, I will follow up and try to improve this situation, based on this valuable feedback. I hope to have Christy back, and that the situation is improved for her next stay! Kelli Creek is a little slice of heaven. It's a beautiful room with a view of the ocean including a great kitchen, comfy bed, and laundry. It's also right next to the bus stop as well as Blackerby Ridge trailhead making it super convenient to get to all of the best sites in Juneau. Kelli was super helpful and gave us a great deal on a tour. 10 out of 10. Would definitely recommend. Perfect place for our visit to Juenau. 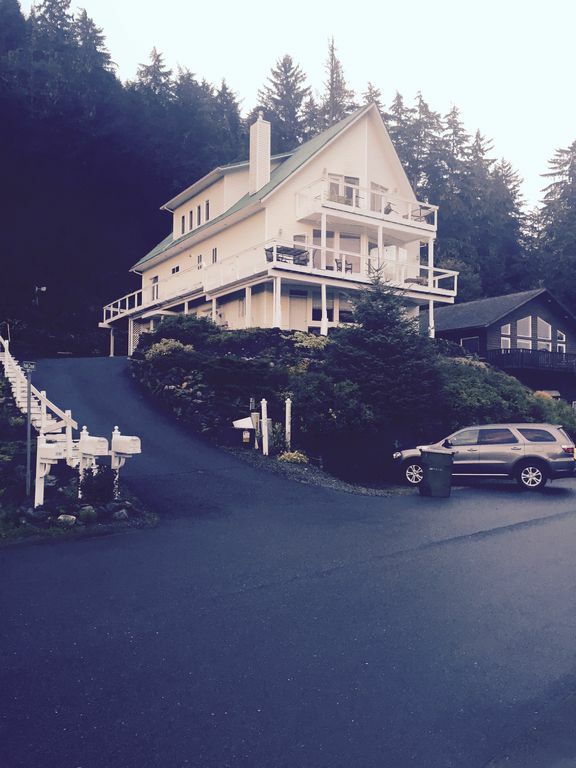 Kelli's property is exceptionally well appointed (fully equipped kitchen, large bathroom, a washer and dryer, TV), very clean, excellent location convenient to downtown Juneau, the airport, and the Valley, and has a fabulous view of the channel. The wifi connection was a bit complicated for us as less than tech savvy but for someone better knowledgeable it wouldn't be a problem. In any event it wasn't an issue for us. We would highly recommend Kelli's property for anyone visiting Juneau and we intend to book again for our return visit to Juneau next summer.